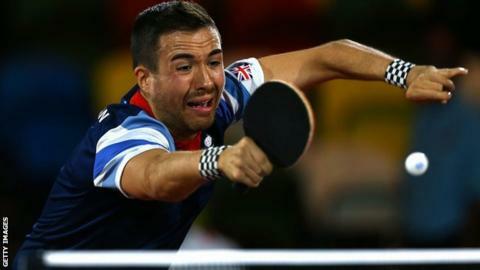 Britain's Para table tennis players finished with 12 medals after a strong display in the team events at the Slovenia Open. Rob Davies and Will Bayley both added team golds to their singles titles. Davies and team-mate Paul Davies beat the Netherlands 3-1 in the Class 1 final. Bayley teamed up with Paul Karabardak and Billy Shilton to defeat a Belgium/Netherlands combination in the Class 7 decider. Dave Wetherill added gold to the bronze he won in the singles, winning the men's class 6 event with the Croatian Pavao Jozic. Jack Hunter-Spivey and Tommy Urhaug (Class 5) and Kim Daybell and Aaron McKibbin (Class 10) won silvers while there were bronzes for Sara Head and Jane Campbell (women's Class 1-3) and Tom Matthews and his Swiss playing partner Sylvio Keller (Class 1). "We really believed we could win today," said world number two Bayley. "We might not have been favourites going into the final but I just stayed really cool and calm. "I think I just had the edge today and it was great to get the gold medal. Paul played brilliantly in the doubles - that was probably the best we've played together in the doubles." Rob Davies and Paul Davies came though a tough semi-final against Italy and won their opening two games against Germany in the final. Germany came back to win the doubles before fought 3-1 before Rob Davies recovered from a slow start to win his second match and give GB a 3-1 victory. "I needed a lot of energy to pick myself up after the doubles," he admitted, "but I managed to start playing a bit better and he was getting a bit nervous. "Once I was ahead I just tried to keep it going but there were some very close points and I managed to keep my cool. That's the biggest part of my game at the moment - keeping my nerve and fighting."